My humble offering today is Tomato Choka. It is humble because this recipe is very easy to make, but very tasty. It requires few ingredients as well. 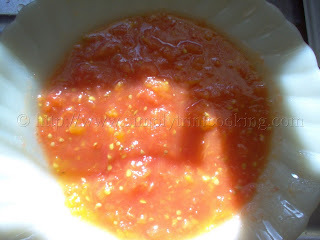 However, before I go to talking about how to make tomato choka, I would like to thank all visitors to my, blog especially those who leave comments. I make it my duty to read each comment I get, so keep the comments flowing. As you may be aware, I posted the Baigan Choka recipe sometime ago; Tomato Choka is just another type of Choka we prepare in Trinidad. What I will be doing is showing two ways in which we make it; I hope you enjoy it just as I do. This type of Choka also goes well with Sada roti ; I personally enjoy it with CRIX ! Both methods are easy and they produce a tasty choka. 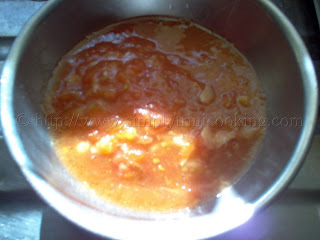 There are two methods to making tomato choka. 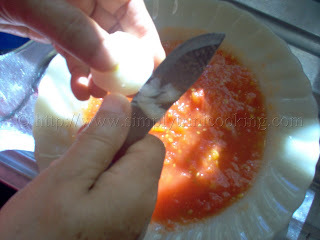 The first method uses cooked tomatoes while the second uses raw tomatoes. The choice of method will depend on your preferences. However, the second method is a lot quicker to do. You can have your choka ready within just five minutes. The first method is similar to the Baigan Choka. The tomatoes are either roasted or boiled and the skin removed. 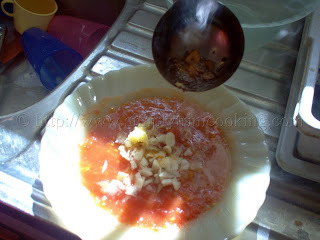 Care must be taken though because the tomato skin is very thin so it will cook very quickly. 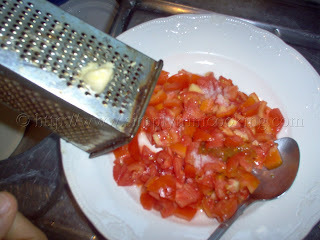 The tomatoes are then crushed to a pulp. Mix all the ingredients together and allow to cool. Dice raw tomatoes and add chopped garlic, salt and pepper to taste. As I said earlier, Tomato Choka really goes well with Sada roti so I encourage you to make the roti when preparing this dish. 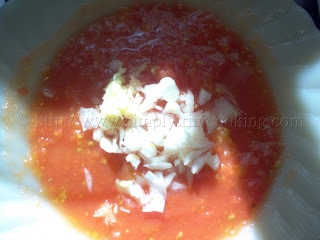 Sheldon L., T&T: I love tomato choka. How about I try to make it myself now. I wonder how that’s gonna turn out! If you follow the pictures you just can’t go wrong. I love the taste of “fried garlic until brown”. Will try this recipe as it looks both simple and tasty. Keep up the good work. Really enjoy the pictures. 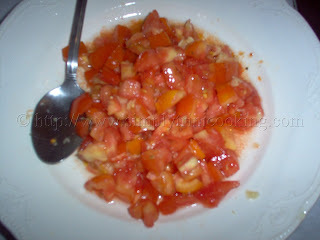 Gosh, you would not believe this but I am not a fan of tomatoes in general but love tomato choka. I do have a strong preference for the roasting of the tomatoes though, such a big difference in flavour (honestly, I even throw in a little of the roasted skin for a little extra smokiness – YUMMY). I have now spent about an hour on your blog. Really enjoying it!! Thank you for taking the “hit or miss” out of my tomato choka… you are making a cook out of me! Bless! 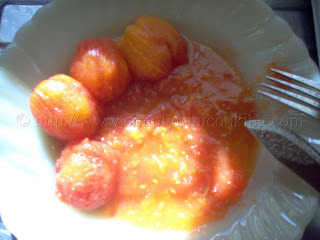 My sis from T’dad, visiting in DC/VA made some tomato choka last week, one day for breakfast. It was great. I knew all about it from home but never really got into it. I just called her in DC and she said that she was having tomato choka for breakfast. I turned on the computer and asked for Tomato choka Trinidad style and I got you. I am so happy. Going to make it right now. #1 method. I will look for sada roti next. Just remembered that I do have a West Indian cookbook. God Bless and thanks for your blog. No need to pull out the cookbook Majorie. There are lots of recipes on the site.